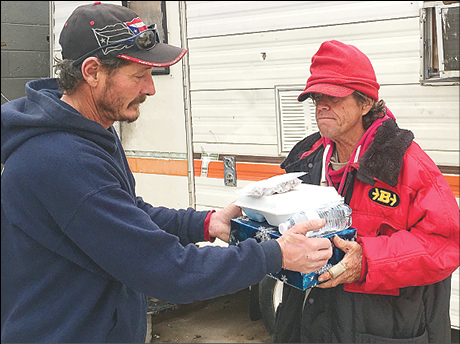 Members of Moore-New Life UMC have joined hands to help feed homeless people camping not far from the small church in the southern Oklahoma City metropolitan area. The congregation "truly does have a heart for mission and outreach," said Pastor Kathy Brown. At New Life, the volunteers include Mary Williams, who works with her "97- and 2/3rds-year-old grandmother" to prepare soup for the hungry. Her grandmother, Thelma Kienlen, chops vegetables for the soup and casseroles. "It gives my grandmother a purposeful thing to do," said Williams, who retired in 2014 as a professor of computer science at Oklahoma City Community College. "All the casseroles have vegetables in them." She collects fruit to be given out too. Some church members help raise money for the 2-year-old project by turning in aluminum cans for recycling. Others donate food or help prepare the large pans of casseroles and soups that are served to the people who live in makeshift camps. Williams has noticed that after they initially serve food at a site, more hungry people will be present the next time. "Word gets around," she said. Also active in the mission is Bendee Zuck, who became involved when "God put on my heart that I was going to work with the homeless." She estimated the church feeds 35 people twice a week. Meals are transported to the camps in church members’ vehicles. She worries that they’re not doing enough. "There’s more hungry people than that," she said. New Life’s mission was inspired by the efforts of "Ice Angels" Lenny and Mary Kaplan, members of OKC-Mosaic UMC. They serve food and give out clothing and supplies to people living on the streets on the north side of Oklahoma City. The New Life volunteers also hand out clothing. The church learned those who are homeless "wear their clothes until literally they’re so soiled that they can’t wear them anymore," Rev. Brown said. Zuck got advice from the Kaplans on how to start the ministry. First, they offered bottled water and some sandwiches. They got crackers from United Methodist-related Skyline Urban Ministries, which continues to give food to the New Life project. When the weather got colder, "we realized they needed hot food," said Zuck, who is a teacher in Moore Public Schools. The group’s goal is to "be the hands and feet of Christ," Zuck said. When the volunteers serve at a camp, "we just say, ‘Here’s this food.’ We listen to their stories and treat them just like you would treat anyone else." A Moore-New Life volunteer gives food to one of the beneficiaries of the church’s work for the underprivileged.